Buy neopoints. It’s what every Neopets user wanted to do until Neopets came out with Neocash. 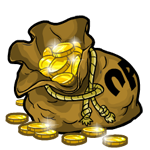 But Neocash is slightly different than neopoints: Neocash is another form of Neopian currency. You can use it to buy exclusive Neopets items such as clothes, accessories and backgrounds for your Neopet, as well as furniture for your Neohome from the NC Mall, which cannot be bought using neopoints. But unlike neopoints, Neocash have to be purchased using real money, although you can win some Neocash in certain giveaways. There are two ways to buy Neocash: (1) by buying a Neocash Card in real life or (2) by paying for them using your credit card or PayPal account through the Neopets website. For either alternative, you will be using your real money to buy them. You can buy a Neocash card at a number of stores, such as Walmart and Toys “R” Us. For a full list of official stores, click this list of all stores selling Neocash cards. After you have done so, you may redeem it for Neocash on the Neopets website. You will need to log into your Neopets account and click on “Redeem Neocash Card”; after which, key in the PIN code found at the back of your Neocash card (scratch the metallic foil off using a coin or something) which you have just bought. And hooray! You will see your new Neocash balance, and you’re now ready to shop at the NC Mall! To purchase Neocash from the site using a credit card or PayPal balance, do so from the NC Mall. If you are using a credit card, get it ready because you will have to key in the relevant credit card information. If you decide to pay using your existing PayPal balance, you will be prompted to log into your PayPal account (just follow the instructions on screen). Besides getting the Neocash, you will also receive a virtual Neopets item for free after you redeem a Neocash Card (i.e. if you redeem 3 Neocash Cards, you will get 3 free Neopets items). And for every purchase of $5 in card value, you get a free NC gift box (you’ll get 5 Neopets gift boxes if you buy and redeem a $25 Neocash Card)! At the point of writing, there are no other official ways to buy Neocash, besides the two options listed above which are mentioned on the Neopets website. Do not believe any website or party which claims to be authorized by Neopets.com to sell Neocash (or any form of Neopets currency and/or virtual items) which are not featured on Neopets.com. Also, if you are buying Neocash Cards, do check that the foil covering the PIN code at the back of the card is not damaged or broken in any way. If someone tries to sell to you one which has the foil damaged, don’t buy it as the code may have already been redeemed. To be safe, buy them in their original packaging from the official stores. All of your existing Neocash, including those you have bought and redeemed, are non-refundable. So unless you are absolutely certain about buying them, don’t. Besides, it’s probably your parents’ money which you are using, and they can be spent on many other useful stuff in the real world as well. Remember, Neocash is only a form of virtual currency and you can continue to play Neopets even without buying them. I CANT GET SOME NEOCASH !!! I LIVE IN PHILIPPINES !!! HOW CAN I GET NEOCASH ???!!! 11 YEARS OLD . . . . . .
wow, just redeem my redeem a $25 Neocash Card. thank you very much! I think the price is good. This will give the spender more advantage to the other players of the game. Boo. That is so stinking bad. I am Rachael Green from Astoria, Queens. Hey thanks for the advice. I ‘m forever trying to look out for bargains too. How long does it usually take to have these coupons? .